It's been another tournament of thrills and spills with a dramatic conclusion. What have the panel made of it all? The 21-year-old produced a dashing display of power and guile to stun the in-form Novak Djokovic 6-4 6-3 and become the first German since Boris Becker in 1995 to lift the ATP Finals trophy. I don't really think that anybody saw Zverev winning, certainly in straight sets. It was a remarkable end to the week. It was a slightly subdued week as a whole I would say. Obviously, only one three-set match, then things bubbled up at the weekend with that extraordinary semi-final between Zverev and Federer and the drama with the ball boy, the crowd reaction, Annabel doing brilliantly to make sure that everything was okay, and then the huge surprise in the final. 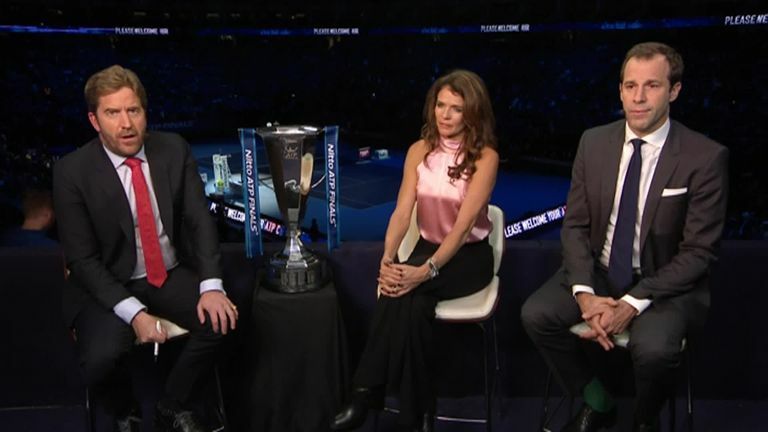 Marcus Buckland, Annabel Croft, and Greg Rusedski discuss the ball boy incident! I thought Zverev was amazing. He stood up to be counted and came out knowing that he had to serve well. Even though he didn't push Djokovic hard on his serve, he looked so comfortable and he was also moving brilliantly. In the end, Djokovic was saying, 'I can't get through this guy'. It was like Djokovic was playing the mirror-image of himself, but Zverev had more power. 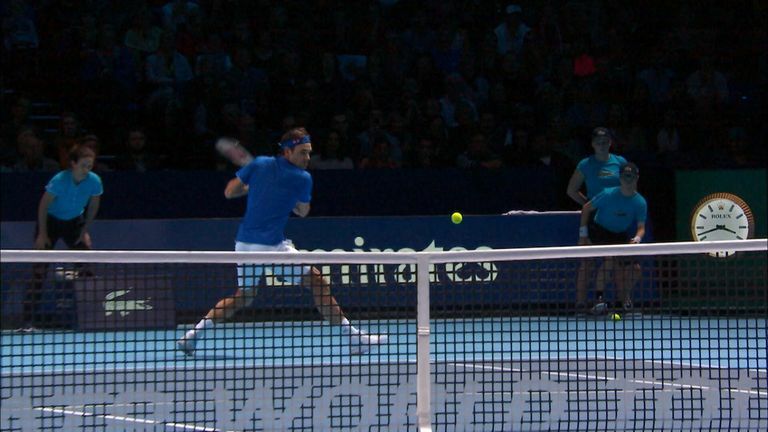 He was hitting the forehand harder, the serve harder, the backhand harder, but I expected a wobble and we had one when he lost his serve, but crucially he didn't react and he broke straight back. I think this makes things exciting for next year and beyond because these younger guys are stepping up and next year one of them will be ready to push through and win a major. Today Novak was playing catch-up and he just didn't have the extra gear which we've seen so often. Two factors, Zverev, and secondly, sport throws up these kind of things every now and again. But I think this makes things exciting for next year and beyond because these younger guys are stepping up and next year one of them will be ready to push through and win a major. I thought it was a big shock when it started with Roger Federer losing to Kei Nishikori and then we had that extraordinary scenario where he needed Dominic Thiem to do well in his final group match, which would then decide whether Roger would go through, but then Roger's tennis went from strength to strength and we thought that he was going to raise it to the next level, but it wasn't to be. And nobody could have predicted what was going to happened in the final. Zverev totally won the crowds over and he is going to be one big superstar. Sascha Zverev came out, embraced the challenge, embraced the big occasion in the biggest match of his career with such mental strength and such freedom of his shots. He came out, struck the ball with authority, took his game to Novak. Djokovic wasn't at the level that we've seen because he was spectacular throughout the tournament. It certainly makes it interesting for 2019. After the emotions of Saturday, Zverev totally won the crowds over and he is going to be one big superstar. Another great tournament. We obviously thought that Novak was going to be perfect, we thought that he was going to be unbeatable, and he was for quite a while, but Zverev was a real revelation wasn't he? He stepped up to the plate and played really consistent tennis. He didn't attempt to go for winners on every ball, which might have been a temptation and he actually outfought Djokovic mentally and physically. That doesn't happen too often. Zverev will play a huge part in the future of tennis - he's a big personality. The tournament took a little while to kick into gear but by the end of the week we were getting some top quality tennis and Djokovic was obviously right up there, but I was so impressed by Zverev. Two matches in after he lost to Djokovic, he was looking fractious on the court, looking disappointed, frustrated, not quite knowing what to do. But he got his head right for that match with John Isner, and what he did against Federer, to come out and carry that on in the final was awesome - he deserves the title. Zverev became the third German to capture the ATP Finals title. Boris Becker won titles in 1988, 1992 and 1995 and Michael Stich in 1993. Zverev is the youngest champion at the tournament since Djokovic won in 2008. We on Sky Sports have been covering tennis for so long and we've been so lucky to have the generation we've had. It's perhaps fitting that right now the final match we had was the new generation bursting through. It will be interesting to see where they go from here. The final was spectacular, a star is born, and this is exactly what men's tennis needed because going into 2019 we were just saying Djokovic is going to dominate. But this young generation has managed to beat Djokovic. The only players he has lost to in the past six months are Stefanos Tsitsipas, Karen Khachanov, and now Zverev. This is what we needed, the next generation to stand up and believe they can beat the very, very best. Spectacular performance from Sacha Zverev tonight beating Novak. He was just too good. He beat Federer and Djokovic back to back at Atp finals. Don’t believe this has ever happened at this event before. Finally young guns stepping up. 2019 looks very exciting for men’s tennis! It was a huge statement from Sascha and now I'm very exciting about 2019. Zverev is the first player to beat both Djokovic and Federer in the same ATP Finals. Zverev's also the first player to beat the top two seeds in the semis and final of the event since Andre Agassi in 1990. The panel were speaking to Sky Sports' Raz Mirza at London's O2 Arena.